Invest three days in learning a revolutionary sales process that will help you achieve the business results you've always dreamed about. This class is the first step in creating a high-performance sales team with better closing rates and delighted customers. Gain commitment to proceed and initiate the job! You will also be introduced to simple diagnostic tools and learn how to sell flat-rate "Air Upgrades" that will help you stand out from the crowd of competitors in your market. 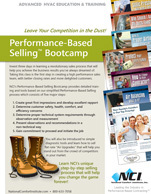 Learn NCI's unique step-by-step selling process that will help you change the game forever! What will Performance-Based Selling do for your company? When your team understands how to apply the principles taught in this course, you'll be rewarded with improved year-round lead generation, better closing rates, higher average sales, increased referrals, and much more. Educate your customers – they will become your competitors' worst nightmare! "Thanks for the class last week. I just closed a sale this evening – a three-ton system and duct renovation for $14,541! Just as you showed us, I started with the survey, then walked around the house with the owner, added test ports and took pressure readings. When I explained how we could solve his dust issues with proper pressure balancing – game over! – Thank you!" Why Build a Performance-Based Team? NCI Members Earn $40 NCI Bucks! Learning Excellence Program Subscribers Earn $119 NCI Bucks! Register Online Today for Performance-Based Selling!